In the past decade laparoscopic surgery for uncomplicated Crohn’s disease (CD) was shown to be safe and feasible. 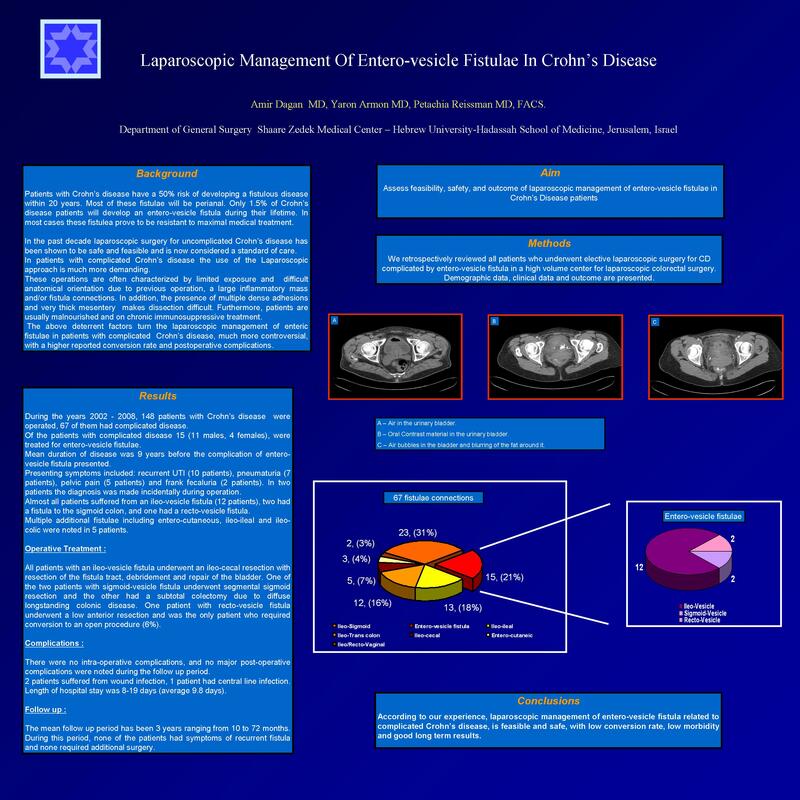 Laparoscopic management of CD complicated by enteric fistulas is more controversial, with a higher reported conversion rate and postoperative complications. We retrospectively reviewed all patients who underwent elective laparoscopic surgery for CD complicated by enterovesicle fistula in a high volume center for laparoscopic colorectal surgery. Clinical data and outcome are presented. During a 7-years period (2002-2008), 148 CD patients were operated, 67 with complicated disease. Of those 15 patients were treated for enterovesicle fistulas (11 males, 4 females) average age was 29. Mean duration of disease was 9 years before the complication of enterovesicle fistula presented. Presenting symptoms included: recurrent urinary tract infection (10 patients), pneumaturia (7 patients), pelvic pain (5 patients) and frank fecaluria (2 patients). In two patients the diagnosis was made incidentally during operation. Almost all patients suffered from an ileovesicle fistula (12 patients), two had a fistula between the sigmoid colon and the urinary bladder and one had a rectovesicle fistula. Multiple additional fistulas including enterocutaneous, ileoileal and ileocolic were noted in 5 patients. All patients with an ileovesicle fistula underwent an ileocecal resection with resection of the fistula tract debridement and repair of the bladder. Additional procedures were added depending on the findings. One of the two patients with sigmoid vesicle fistula underwent segmental sigmoid resection and the other had a subtotal colectomy due to diffuse longstanding colonic disease. One patient with rectovesicle fistula underwent a low anterior resection and was the only patient who required conversion to an open procedure (6%). Postoperatively there was no major morbidity. 3 patients suffered from minor morbidity (2 wound infection, 1 CVL infection). Length of stay was 8-19 days (average 9.8 days). At follow up of 6 months to 6 years (average 3 years) all patients are well with no symptoms of recurrent fistula and none required additional surgery. All patients have received immunomodulating medications. According to our experience, laparoscopic management of enterovesicle fistula related to complicated CD, is feasible and safe. With low conversion rate, low morbidity and good long term results.